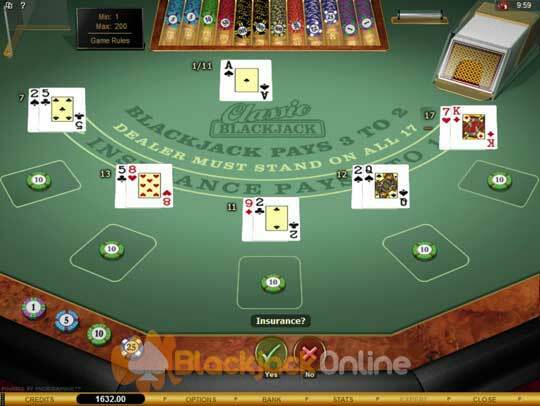 We have compiled our guide to playing Microgamings Class Blackjack game below, you will find all of the game play rules, along with a selection of playing tips. Remember, that you need to be playing perfect strategy to be in with a realistic chance of winning when playing Classic Blackjack! The casino card game of Classic Blackjack is Microgamings best Blackjack game to play, due to the tiny house edge it boasts. 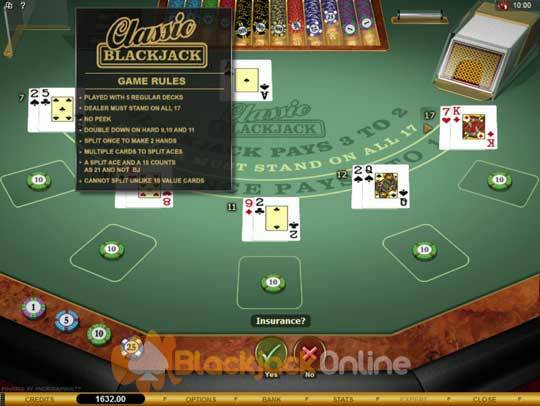 When you are playing this Classic Blackjack game with perfect strategy, then you will be up against a house edge of just 0.13%. Playing with perfect strategy is easy thanks to our Classic Blackjack Strategy Card (right), feel free to download and save it, as it will show you the correct moves to make when playing Microgamings Class Blackjack game online. Playing a Pair of Tens - When you have been dealt a pair of Tens or a pair of Ten valued cards, then you need to Stand this kind of hand at all times. Doubling Down a Hand - When you have a pair of fives, and the dealer has a 2 to 9 valued card showing, then double down this hand. Also, whenever you have a 10’s valued hand then double down unless the dealer is showing a 10 or an Ace, in which case you need to Hit your hand. Another type of hand you should double down on is a 10 or 11 valued hand, but only double down when the dealers card is a 2 to 9 valued card, any other dealers card will call for you to hit your hand. Splitting a Pair of Two’s - When you have been dealt a pair of 2’s, then only two betting moves should be made, depending on what the dealer is showing. You should hit your hand whenever the dealer has an eight upto an Ace valued card, and Split the 2’s when the dealer has a 2 to 7 valued card. Playing a Soft 17 Hand - There is only one way you should play soft 17 hands. Any hand valued as a soft 17 should be Hit. When dealt all soft 13’s to soft 16’s then you should Hit them also, along with hitting any soft 18 when the dealers up card is either a 9 or a 10. If you have a soft 18 and the dealer is showing any other card then you should Stand that hand. Dealer Rules - The dealer uses a 5 deck shoe, and must stand his hand on all hands with a value of 17 or above. The dealer will not peek at his down facing cards. Player Rules - Players can double on 9, 10 or 11, they can also split a hand just once, and can, if they so wish, be dealt multiple cards to all split cards including split Aces. Players cannot split unalike Ten valued cards. Payouts - A Blackjack hand will pay 3 to 2, all other winning hands, including split Aces with Ten valued cards are paid at even money. The Insurance wager will pay out at odds of 2 to 1 when successful.